Terengganu is located in the shoreline of Malaysia, rich and famous with its white sand beaches and handfull set of islands. Whoever come to Terengganu must be delighted with it's people, it's nature, heritage and mind relaxing atmosphere. Among other things popular in Terengganu, of course it's famous keropok lekor. Made of fish fillet and cornstarch mixed together and rolled over and then cut to smaller roll. 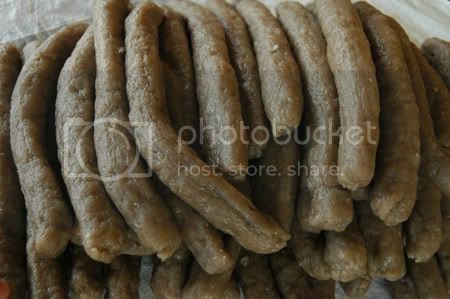 There are two types of keropok lekor which is stewed type and fried type. You can also fry the stewed one but the taste is slightly different than fried type of keropok lekor. Every keropok lekor bought will be provided with a pack of red, not too spicy homemade sauces. Made without any artificial ingredients, a perfect companion to eat keropok lekor cut into small pieces. Keropk lekor stored in a freezer usually become harden and lost it's aroma. Revive them into their tasty state by frying them. A secret tips handed from generation to generation, when they float they are ready to be eaten. Make sure your cooking oil is sufficient enough to allow them float. Not much thing could be done with the fried type keropok lekor. Two words, eat them on their own or eat them together with fried rice or noodle. No affiliation with the famous James Bond. Located in Kuala Ibai, around Prinz Park Hotel and Terengganu Equestrian Resort. Ask the locals, everyone knows this place. Located about 4km from Terengganu Airport. Famously called as Keropok Lekor BSN(a bank name in Malaysia) because of it's owner initiative to use queue management system in his premise.